Trim sophistication for sightseeing or touring the vineyards. 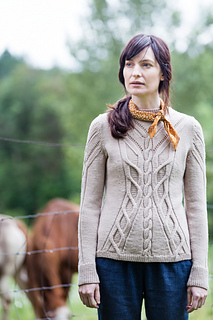 This sleekly fitted pullover in Arbor features bold parallelogram cables filled with reverse stockinette that lean into a central supporting cable, then branch into a flattering V across the upper torso. 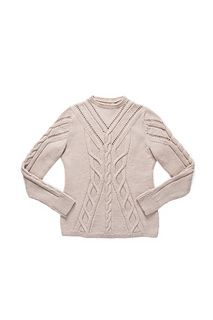 The set-in sleeve caps echo the motif, and delicate single-rib edges add to the feminine effect. Shaping at the waist and on princess seam lines creates a slim fit that pairs well with skirts and boots. 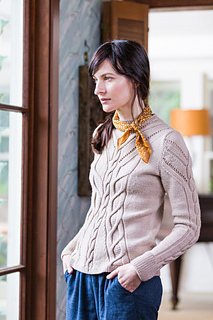 Fieldstone is worked in pieces and sewn together, with the dainty crewneck band picked up to knit in the round after assembly. 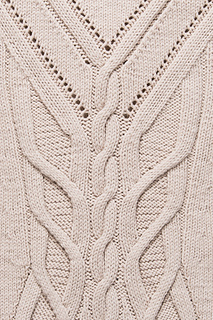 Note: Both stitch and row gauge are important for this garment.